Today was for the most part a day off from my linguistic tour of northern Spain. My friend Sue and I spent the day touring the standard sights of Salamanca, such as the Casa de las Conchas and the Convento de San Esteban. As I had hoped, we came across a good used book store (La Galatea), where I picked up three novels for my bookshelf, all by women: Laura Restrepo’s Delerio, Almudena Grandes’s Estaciones de Paso (actually a collection of novellas), and Soledad Puértolas’s Si al atardecer llegara el mensajero. 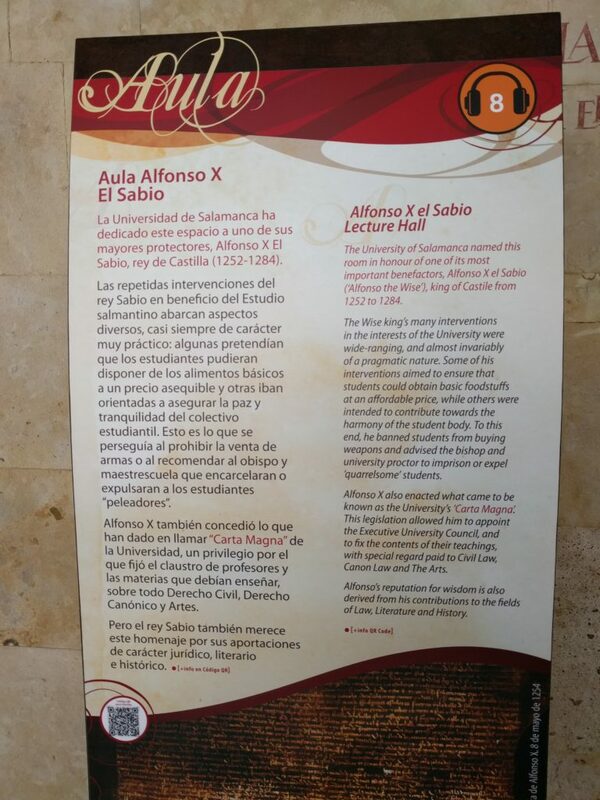 Today’s most linguistically relevant destination was the Universidad de Salamanca lecture hall named after King Alfonso X, known as Alfonso el Sabio (‘the wise’). Alfonso, who reigned from 1252-1284, was not only a scholar, and an early supporter of the Universidad, as described in the informative sign below, but also played a key role in standardizing the Spanish language. The prologue to El libro de la ochava esphera, a scientific treatise from a group of scholars in Alfonso’s court, states that he “removed the expressions that he felt were superfluous or duplicated and that were not written in correct Castilian (castellano drecho), and he added others that were more appropriate; and regarding the language, he himself corrected it” (translation from D. Pharies). 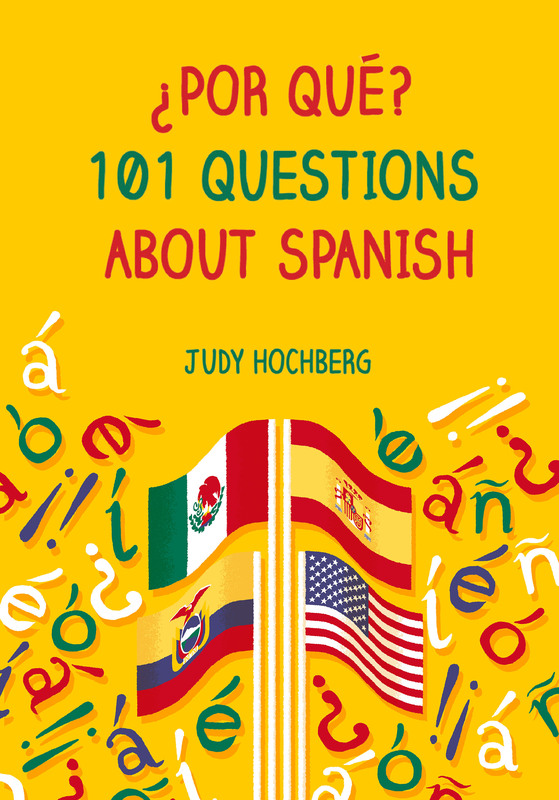 The use of the term castellano as a language name is itself noteworthy. However, my lasting impression of Salamanca will be of the architectural details that both Sue and I fell in love with. Here are our two favorites. 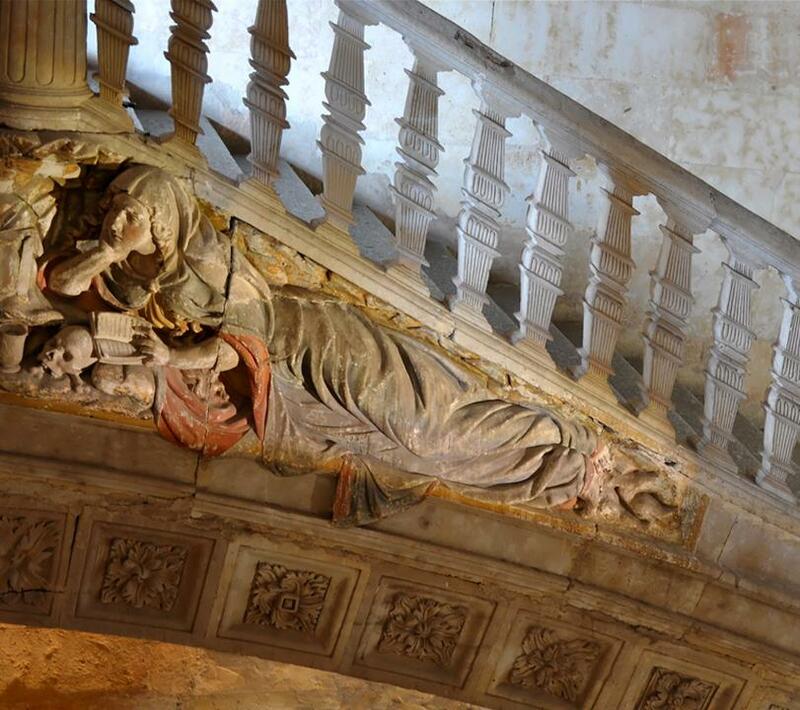 Escalera de Soto at Convento de San Esteban. The artisan managed to fit a sculpture of Mary Magdalene into the triangle formed between the railings above and the arch below. Mary is taking a break from reading in bed, where she is tucked in with a skull and her favorite jar of unguent. Interior of Casa de las Conchas, showing stone carved into honeycomb (left) and basketweaving (right) railings. 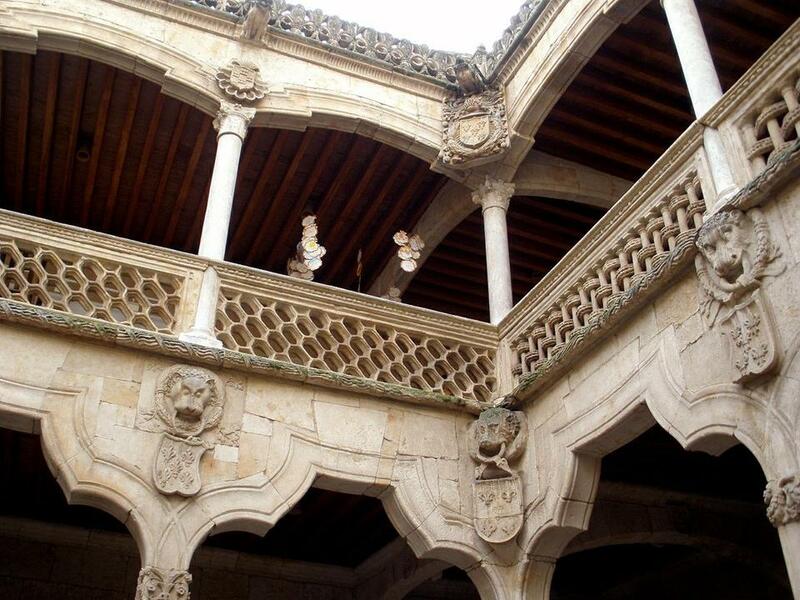 This entry was posted in Linguistic tour of northern Spain and tagged Alfonso Sabio, Alfonso X, Casa de las Conchas, Convento de San Esteban, Salamanca, Spain, Spanish, Universidad de Salamanca on 18 June, 2016 by jhochberg.